Microsoft has started rolling out Windows 10 Mobile build 10586.29 to locked and unlocked Lumia 950 and Lumia 950 XL devices. This update comes to the users who are not part of the Insider Preview program as Insiders received the same update only yesterday. Microsoft releasing software update to non-Insiders this fast only proves that the company is definitely bypassing carriers to push out timely and consistent updates to its users. In the past carriers have created longer delays for OS updates sent out to locked Windows devices. However, today’s rollout reaffirms that Windows 10 Mobile devices will receive more consistent updates – something that will be highly appreciated by the users. All the Lumia 950 and Lumia 950 XL users, including Lumia 950 on AT&T, can now update their handsets to the latest Windows 10 Mobile build 10586.29 even if they are not part of the Insider program. 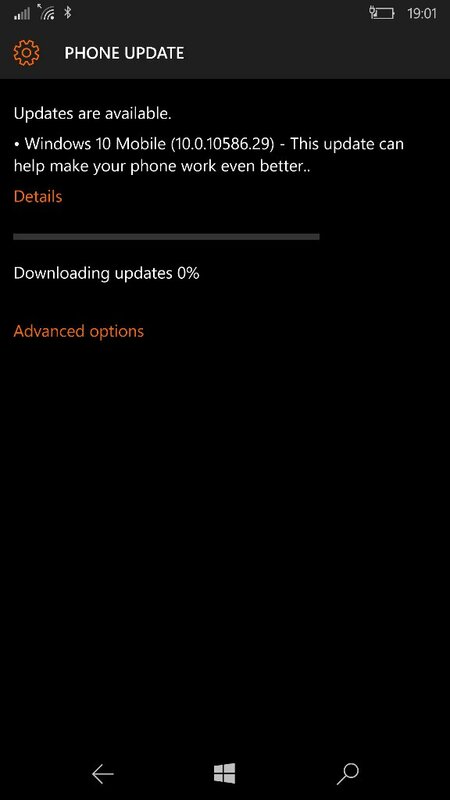 Did Microsoft just put an end to carrier blocking with this first update sent out to Lumia 950 and 950 XL? Seems like so. Don’t forget to share if your Lumia 950 and Lumia 950 XL have received the latest build and if so, please share your region and carrier with our readers too. If you don’t see the update yet, don’t be upset as it may take a few good hours to hit all the devices worldwide.